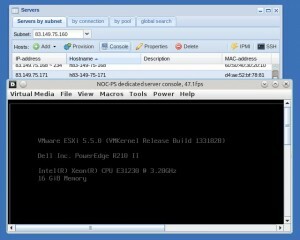 Experimental support for the KVM console of Dell DRAC 6 Enterprise and Supermicro X9/X10 based servers. Do make sure your servers are running the latest IPMI/DRAC firmware. This complements our existing console support (Intel AMT/vPro, Xenserver, Vmware, Proxmox and oVirt consoles were already supported before). Sysrcd (Rescue system) has been updated to 3.8.1. A couple more commonly used IPMI commands like “bmc reset cold” have been added to the IPMI window. Sysrcd 3.8.1 now only boots once. It is no longer necessary to “cancel installation” after you are done using the rescue system.